When I asked the youngest nephew what he wanted to be for Halloween, there was no hesitation, a Homemade Snoopy Costume. At this point, I realized I was being overly brave to give him an open ended choice. For the body, I cheated a little and bought a pattern for a jumper, but altered it by sewing an inside kangaroo pouch to hold tummy stuffing (fiberfill). For the front paws, I bought white gloves and cut out strips of black felt which were tacked into place with needle and thread. For the back paws, I made little shoe covers, held onto his sneakers with elastic across the bottom and around the heel, and again black felt strips provided the cartoon-like digit definition. For the tail, I made a fiberfill tube of material and put a plastic cup at the base to give it non-droopiness and a sassy wag ability. It curves upward because of long stitches on the top side which were then pulled tight and tied off. The HEAD! 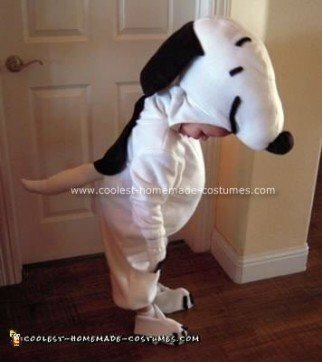 I filched a side view of Snoopy from the internet and then measured every dimension I could think of, total head length, ear width and height, etc. I then figured out approximately how big I wanted this to be on his little sweet head, in length. Then I used fractions and solved for “X” to get the right size and distance on all the features of his head. I used a hood pattern and simply extended it with newspaper cut to the mathematically determined pieces. Then I sewed it all together and stuffed it with fiberfill. Although it looked fine, it flopped on its neck. I finally shortened the neck and stuffed a bicycle helmet up into the head, held in place with Velcro. This should be stable enough to last him through the night!